Since today is Wednesday, I am sharing what is on my work desk with you! Today you will not see much crafting going on, but rather something a bit different. I am working on answering many pen pal letters I have received this week. Many of you know that I love fountain pens, but you may not know that I LOVE writing letters as well as receiving them. On my desk you will see a stack of letters I am answering, plenty of ink (wouldn't be Winnie's Inky Fingers without ink!) and plenty of pens. You may also spot sealing wax, a blotter and even a metal seal. Also on the desk are two of my latest additions to my massive stamp collection. 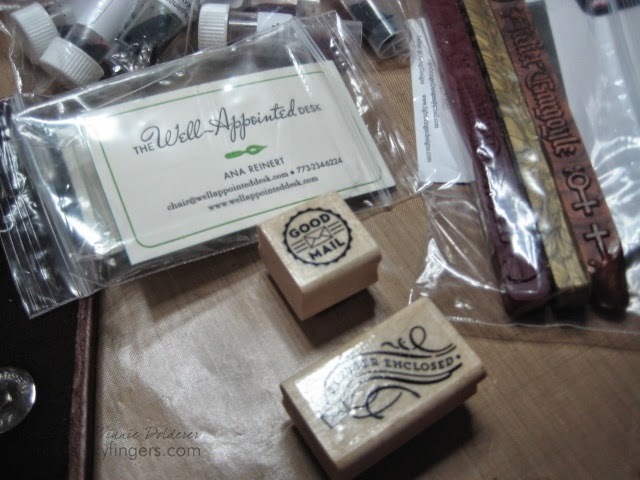 I came across these stamps made by Ana of The Well Appointed Desk and they are perfect for my letter writing! Thank you to Julia for this fun desk hopping! I look forward to seeing what others are working on today. Do you enjoy letter writing? Many are not writing any more with the electronic age as it is, but let me tell you, there is nothing like coming home to find a letter waiting for you from a lovely friend who you get to know a little at a time. Why not pick up a pen and give it a go? I understand your fountain pen addiction completely! I love handwriting and when you find just the right pen, then it becomes a joy! I imagine your handwritten letters must be beautiful. It is nice to receive handwritten letters from friends, isn't it? 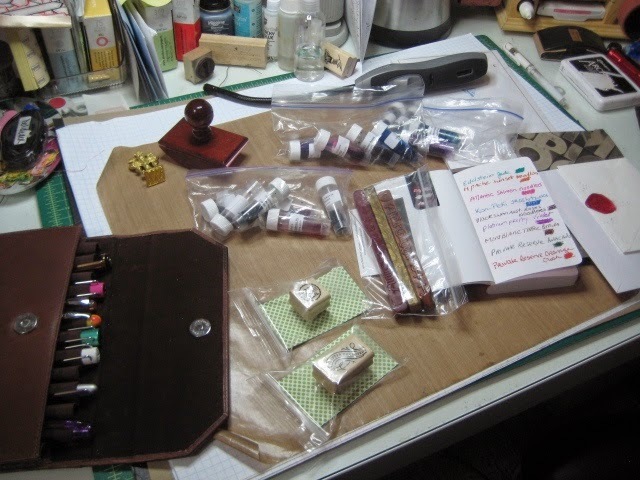 Lovely post Winnie, I love the sight of your desk this morning, be still myy heart: fountain pens and a blotter....lovely. Bet your pen pals love to hear from you...that is quite a stack! Oh wow, sealing wax. I haven't been able to find that in ages. I have several seal stamps that I haven't been able to use. My handwriting is terrible, so I never looked back once I got a computer, but you are right, there is something lovely about a handwritten letter. I am with you on the pens, I have so many of them Calligraphy, fountain and goodness know all sorts. I love using them too. Letter writing is dieing it is sad, computers and emails have taken over, hence postage costs going up. Great desk this week, thanks for sharing. I do love receiving letters and I am always saying I am going to start writing letters but time slips away. I need to just do it!! Lovely pens and oh I love sealing wax. How true, Winnie. I also like REAL letters. I love to open real Christmas cards, read them, hang them up, enjoy them for weeks over the Christmas season. Having a jingly email one just doesn't cut the mustard!! I think it is fantastic that you still have penfriends. I used to have some, too, but lost touch as we all did different things when we became adults - pity. Not really a dynamo - I'm retired. Well, actually, I am of retirement age! Not much retirement going on, though!!! But, not out at work each day, so have more time - technically. Yes, our church group is stunning. I have been married nearly 42 years, and been in several churches as we have moved around. I can honestly say I have never had such support as with this fab group of people. We are not perfect - but we are family. It is really precious to know I am not on my own at this time when John has been so very ill.
Have a special week. God bless you. It's a gift to hand write a letter, something to keep, a memory to store. Good for you sharing your love of pen and paper. I thought I was #59 so I commented on all the nines but when I came back to comment some more I noticed I'm #58...so now I'll visit the 8's Be well Carole #58? Yes, hand writing is a thing of beauty.Mine isn't that great, but I treasure old letters.My father in law was a teacher, and Head Master.His writing was the old "Copper Plate". I used to be a teacher too, and the kids always loved hand writing lessons.We would do exercises, and have good posture, and the kids would try like mad to do neat writing. LOVE fountain pens myself! Even love the sound of the scratching pen on paper! I love to write and it is becoming a lost art. Love those little stamps for the post so sweet. What are in those little containers all bagged up? I didn't think people had pen pals any more, good for you! I'm with you in that we should keep letter writing and exchanging cards alive. I must say since the computer came Into my life my handwriting is not as good. Nice couple of stamps you picked up. thanks for dropping by my blog for WOYWW. Yes give a card in a box making a go as they are so easy. Pen pals are awesome...I used to have a few but not any more. I love you add a wax seal! I'm smiling ear to ear - can you see the smile? =:) I have such fond memories of pen pals, growing up all over the world, we wrote A LOT! I'm so nostalgic and old fashioned, I think we should still correspond this way - LOL! Love your post today! You are absolutely right about the writing especially with afountain pen i must look mine out and give it some work to do .you never knowi might even write to you ....in afew weeks post DD wedding.